Last week saw the end of London Collections Men – one of the biggest events in British menswear, with its Spring/Summer’15 shows bringing the best in design to the catwalks and us to our knees with their next season wears. Including fashion’s favourites – man of the moment Jeremy Scott, super duo Agi & Sam as well as the big boys like Burberry and Alexander McQueen – the event also saw newcomer names to know showcase collections, all with varied inspirations and cool ideas for 2015. Inspired by writer and adventurer Bruce Chatwin, Christopher Bailey created a range of cool wears to explore, including suits, satchels, trenches and floppy bucket-style hats. Printed with the words “Adventure!” and “Exploration!” the traveller theme wanders the line, but – with colourful kicks and printed bags worn alongside the collection’s palette of teals, greens and dark mustards – there’s a sense of modern day nomad; a city-hopping hipster with a thing for luxurious loungewear. If that’s you, seek this out come Spring/Summer’15. Agi Mdumulla and Sam Cotton put together a liberating and refreshing collection for men that all the girls will want to wear, too. Long shorts and tees with elbow length sleeves were spied in their line up of smartwear designed for both style and comfort, painted in muted greys, mustard and blues, and worn on the catwalk with knee high socks and thick-strapped sandals. Always a hit with the fashpack, the design duo’s popularity has a proven source, and their range of longline garments, seen sometimes with apron-like fronts for next season, are sure to be another hit. Themed around aviation, Christopher Raeburn’s S/S’15 is all about utility wear, but a truly wearable kind that’s also inspired by the street. Tee and short ensembles were paired with caps and trainers, with everything painted in monochrome and punctuated by orange, grey or some sort of pastel khaki green. Patches were put to bomber jackets and tshirts – a collaborative detail designed with Avery Dennison, which resemble playing cards – and other cool notes about the range include the use of meshing made from parachutes as well as the feature of lightweight Japanese tech fabric, which took Raeburn’s theme just that bit further off the ground. Practical pieces saw hair knitted into garments (fun items including bright red tunic that resembled a giant pom pom) alongside animal spot prints, bones and a general punk attitude. Perfect for those who like their fashion high-spirited and with a side of angst. Designer father-and-son, Joe and Charlie Casely-Hayford have reinterpreted Spring/Summer menswear staples and come up with a few cool things; wintery looking pinstripe (that are actually formed on light linens) etched along shorts, sweats and caps, even, as well as more structured goods like bomber jackets and shirts which bare contrasting tails. For the most part, the lineup remained monochrome and was textured with print throughout (there’s a caged check as well as some digital prints) until an injection of tie-dye-like greens, blues and purples were put into the mix. We’ll be in it, too come Spring/Summer. 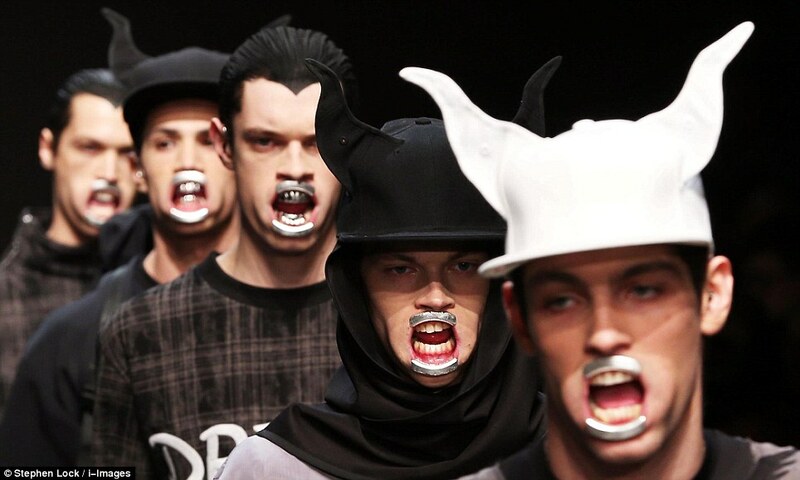 Showcasing at the MAN show – one curated of the freshest of new talents about town – Bobby Abley (the guy responsible for all those mouth-pieces last season) sent a collection inspired by Disney’s The Little Mermaid down the runway, and straight into our hearts here at SPICE. Suckers for nostalgia, we love how this line harked back to the tale via a few strategically placed shells and eel eyes, but submerged in skater style, with long shorts and slim tees with mid bicep-length sleeves, it’s sure to be a hit on the street, too. Inspired by traditional Muslim wear, newcomer Nicomede Talavera debuted at MAN with a menswear collection that is both memorable and wanting to be worn. Inspired by the minimalist art of Sol LeWitt and referencing patterns of Louise Bourgeois‘ textile works, Mr Talavera went to town on length and lines, crafting cool, sleeveless, striped dresses that look even cooler when layered under of any of his boxy jackets or wide-leg trousers. Trust us, we’ll be seeing more of this designer – and hopefully from within our own wardrobes. And lastly, we’ve something from the highstreet. Clearly referencing some pretty great moments in history when fashion and music have collided, menswear giants, Topman have promised a nostalgic range of goods for Spring/Summer’15. The ‘70s and the ‘90s feature heavily in the inspiration, with Britpop greats like parkers (Oasis style with reams of fur about the hood), flared suits (like those groovy ones worn by Pulp’s Jarvis Cocker) and kimonos (akin to the great Jimmi Hendrix’s) made a priority for next season – all modernized by fashion’s favourite thing: clashing print. Pull everything on with your best attempt at a messy, fringed ‘do and you’ll definitely be one of the cool kids next season – that’s if you can get over the skinny jean, anyway.